Apple's newest MacBook Pro is getting more features from an unlikely source, as Microsoft is rolling out Microsoft Office support for the laptop's unique Touch Bar. Originally previewed last week for beta users, MacBook Pro owners at large can now access special shortcut features on the Touch Bar for Microsoft Word, PowerPoint, Excel and even Outlook. 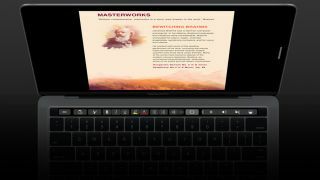 Similar to supported apps like Spotify and Photoshop, Touch Bar support allows users quicker and easier access to the Microsoft Office suite's most used features, as well as make the Touch Bar itself more enticing to customers than just a fancy way of playing DOOM. As for how this new update can actually help a MacBook Pro user's workflow, Word now cuts out clutter for a clearer screen, moving several formatting tools to the Touch Bar. PowerPoint pros can use the keyboard-inlaid screen to track their presentation and timer (a major plus for timed school or keynote presentations), while Excel spreadsheets can use the Touch Bar to quickly access important functions and cell formatting. Outlook on the Touch Bar can tack on attachments to emails with a single press of the touch-sensitive screen, as well as look up calendar appointments and even join in on meetings via Skype.